In the wake of a huge build-up surrounding Adobe’s mysterious Project Rigel, we now have its result: Photoshop Fix. Exactly one year after a sneak peek at Adobe’s annual MAX Creativity conference — the crowd will assemble to witness the launch of the shipping version. In addition to being a retouching tool, Fix is something of an aggregator in that uses the company’s recently unveiled CreativeSync technology to gather photos from a variety of online sources, such as Creative Cloud, Lightroom, Facebook and Dropbox as well as local photos residing or captured on your device. Despite its complexity under the hood, Fix is a powerful retoucher that is easy to learn and use. It does not have a huge number of moves, but is designed to be flexible and social network-ready. Like Adobe’s other mobile apps, Photoshop Fix is built with the company’s new Creative SDK. Because Photoshop Mix, Shape and Comp use a common framework, they can open files, pass files to each other and send files to the desktop. Photoshop Fix relies on the GPU, and thus is capable of opening really large files — up to 50MB — and lets you retouch those photos in real time. 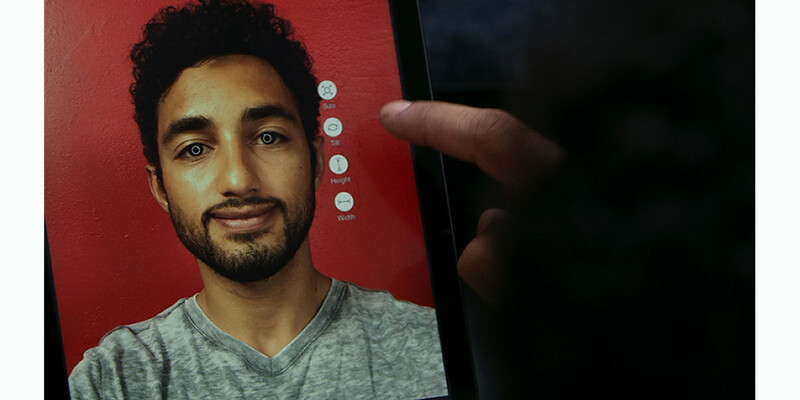 The app also has a new facial detection feature that lets you alter a person’s features and expressions. You can literally turn a grin — or even a scowl — into a genuine smile. Available for both the iPhone and the iPad, all work is designed to be interoperable and non-destructive. If you’re a Photoshop user, or are familiar with any photo editing tools, you’ll have no trouble navigating Fix’s features. There’s all the usual suspects plus a few extras that may veer into the realm of special effects. For example, in addition to Crop, Adjust, Smooth, Light and Color is also Liquify, Healing, Paint, Defocus, Vignette and more. Content aware technology aids the Healing tools. Within those broad categories are a large number of controls. Liquify lets you do things like Warp, Swell and Twirl using finger based gestures. The newest part of the Liquify tool is Face, which is at the heart of Fix’s portrait retouching functionality. After choosing Face under the Liquify tab, loading a portrait will bring up a number of different facial points. Each of those has a set of controls that allow you to enhance facial features such as slenderize the nose, jawline and cheeks — or fatten them up if you want. Smile tweaks include adjusting each lip individually as well as widening the smile. When you’re don with edits on your mobile device, just save to Photoshop and it will instantly launch the app on your desk top complete with layers representing your edits. Photoshop Fix is a simple, fun consumer app that immediately puts Adobe in the portrait editing space with specific features intended to improve people’s looks. It is not the first app to tackle that genre — either on the desktop or on mobile, but it combines those features with an appealing combination of controls specifically targeted to Creative Cloud users and photographers. Free for the iPhone and iPad, you have nothing to lose by giving it a try.